When you arrive at Suvarnabhumi airport you will notice these machines standing everywhere in the terminal. With screen, keyboard and handset, you can undoubtly know that you can make a phone call and get an internet access from these machines. Furthurmore, they can provide you with basic airport information too. To make a call, lift handset and then following the instruction on screen. It's a touch screen so you can dial number by touching it. It's operated by coins, TOT phone card and credit card. The mininum charge for credit card is 100 baht so if you just make a local call or checking e-mail for a few minutes, you'd better use coins or TOT card. For international call, you have choice between 007 or 008 service. Dial 008 will use Voice over IP technology which offer lower rate. If you plan to call to other country, visit TOT site to check detailed phone rate. Unfortunately, internet service is not provided here for free, you also have to use coin or TOT card to get access. It charges 0.5 baht per minute or 30 baht per hour. Touch the screen to activate it and follow the menu, you will be able to learn more about facilities provide for you at this airport. TOT card is available at Nai-in bookstore at the price of 100 baht and has store-value of 120 baht. Or you can buy from Family Mart - the convenient store. Both are located on every floor except the ground floor. 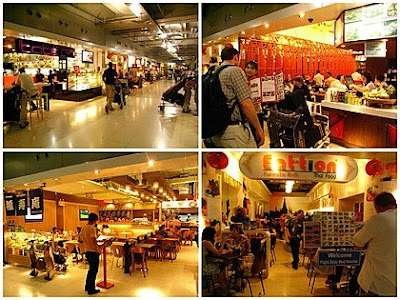 Left Baggage services are on arrival and departure floor (2nd and 4th floor). They are operated by Chubb, the famous security company. It costs 100 baht/piece/24 hour. You can left your belonging here up to 4 months but on the fourth month rate go up to 200 baht/piece/24 hour. Exchange booths are everywhere inside the terminal. There are 2 banks offering exchange service at the compatible rate. So choose one that nearest to you. Post service is on departure floor (4th floor) at the far right. Next to the post office, there is internet service from CAT at the cost of 300 baht per hour. Muslim prayer room is on 3rd floor. Also on 3rd floor, there are plenty of restaurants to your choice. Some restaurants accept flight delay meal voucher. Black Canyon Coffee, the Thailand's leading coffee chain. If you fly in ahead and have to wait for friends flying to join you at the airport, you can wait for them at the far left on arrival hall after you pass the custom. Seats are available in this area with snack and drink counters are nearby. But that area reserved only for arrival passenger. So, if you expect someone to pick you up at the official meeting point, you have to walk to the right to this meeting point near Gate no.3. The best airport shuttle service in the Sacramento Region. Cameron Park Airport Shuttle We provide direct transportation to and from Sacramento and San Francisco International Airport. Nice blog with very useful content. Thanks for posting. Book DC to NYC Bus Tickets online. Compare bus operators, bus schedules, and find bus tickets prices from Washington DC to New York City. No booking fees! Hi, You have very useful information. I am just waiting for something more, so please keep sharing. Have a nice day.